Last night was a return to Heddles & Treadles, my local(?!!) Guild of Spinners Weavers & Dyers. Their venue has changed due to hall refurbishment and they now meet in a village hall almost an hour away from where I now live. It was a heck of a trek but we had a great meeting. Some learnt Dorset buttons, I, well it was mostly a chinwag for me. It was a worthwhile discussion, I discovered how some people space dye their knickers, something I confess had not occurred to me, but I believe Kirstie Alsopp was doing it before Christmas. Something I can't find any evidence for bit I wouldn't be a bit surprised. It's well worth leafing through old books and updating ideas, giving the old a new lease of life. Think of that when you next put on your old grey pants ladies! 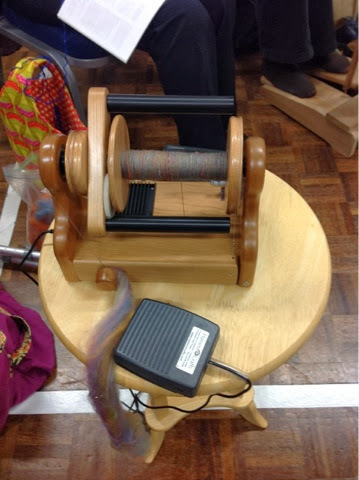 I also caught up with Ambermoggie from ravelry who is in our guild and was using a Hanson mini spinner, something I hadn't seen before, but it saves her knees (having been operated on). It's a brilliant machine, with different speeds and she highly recommended it. It reduced her plying time considerably. The bobbin is larger than a standard bobbin and so would hold a sizeable amount, which would be needed as more would be spun in a shorter time. I was impressed with it and would definitely recommend it to friends or students who wanted to spin but had difficulty with their joints. Hey Kate, I've finally found your blog;o) So happy! I'm looking forward so much to popping by to see you at Wicker Wool, Cedar Farm, and learning from your fine, creative self. I'll look forward to seeing you there. It's going to be a great day, Cedar Farm is a brilliant and inspiring venue. 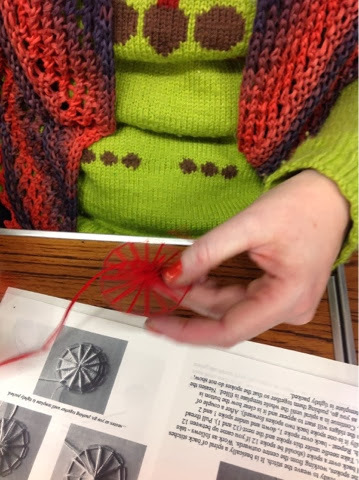 I am a primarily a spinner from the North West of England, along with my knitting partner Ginny I dye and spin my own wool and she creates all manner of wonderful things to wear.